For more than a decade West Michigan, specifically Grand Rapids has been in a leadership role in the green building movement that has swept the world. Leaders in the office furniture industry as well as the design and construction industry paved the way which lead to many of the first green buildings in the world. Leadership in Energy and Environmental Design (LEED) is a 3rd party green building standard that is transforming the way the built environment designs, constructs and maintains all buildings and communities. LEED is a green building tool that addresses the entire building lifecycle recognizing best-in-class building strategies. More information on LEED can be obtained on the U.S. Green Building website. One of the major oppositions I heard about LEED is the cost to obtain. Comments like that typically come from those that don’t understand LEED, those that have little or no experience with it, or those that are not looking at the total cost of ownership of a building and only concerned with getting a building constructed or renovated at the lowest possible cost without concern for the people that will live and work in the building or the environment. Time and time again I hear the successes of improved productivity, improved health, reduced energy usage expectations, lower water usage than traditional buildings and landscapes and there are many of those stories documented for others to read. Many communities in Michigan have received grant money to address storm water run off in their communities. We continue to pour money into addressing this issue on the back end – why do most of the design and construction teams along the lakeshore of Lake Michigan choose to ignore that issue and avoid even exploring new technologies? My hope is that the rest of West Michigan will someday realize that public health is directly related to the way we design and construct our communities and buildings and that money will no longer take precedence over health and the environment. Short sided thinking will not make an attractive community for a younger generation either. Can We Really Save The World? I have been inspired to write about my work after many comments from friends and people that I am connected with through social media that they enjoy my posts, act upon some of the ideas that I’ve shared in my posts, and they have shared with others which I hope has also lead to action. 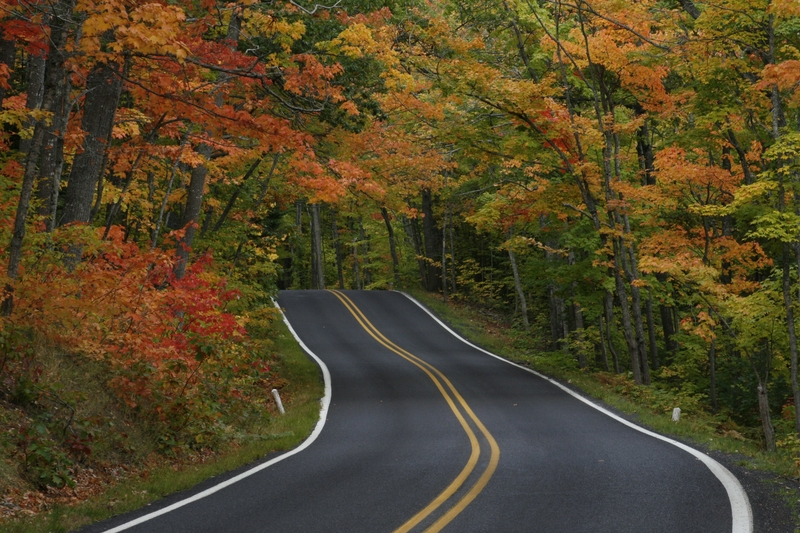 Fall is the perfect time to start this blog as it is my favorite time of year – and fall in Michigan is so beautiful and inspiring and a perfect reason to do what I do everyday, work towards a more sustainable world. In order to accomplish a more sustainable world I believe we must understand that sustainability is a continuous improvement journey and there is not an end point. One day we are not going to wake up and be able to claim that we have reached our goal and our work is complete. Accept that thought please. So I will offer this definition of sustainability from the Brundtland Commission Report “Sustainable development is development that meets the needs of the present without compromising the ability of future generations to meet their own needs.” Pretty broad definition isn’t it? What does this mean to you? 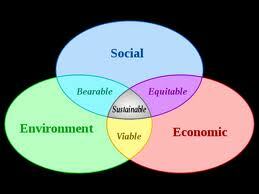 I also want to offer this, sustainability is a balancing act and let’s use a three-legged stool as an analogy. The three legs of this stool are: economics, social, and environment or in other words the Triple Bottom Line (some may know as people, planet and profit). We can give credit to John Elkington for this framework. He created in the mid-1990s as a way to measure performance in corporate America. There is so much involved in becoming a more sustainable person, business, organization all leading to a more sustainable world. For many years we have ignored so much and have focused on convenience, having more stuff and faster production which have lead to waste, environmental issues, social issues and an unstable economy. Can we change that at this point in the game? Hello, welcome to my blog. I am creating this blog to share my experiences that I gain through my work in sustainability which began about 10 years ago. I am fortunate to work with many organizations across the state of Michigan and learn many things that may help others reduce waste, reduce cost, reduce environmental footprints and be more efficient. I am passionate about creating a better balanced world. So this blog is for anyone wanting to learn about sustainability and helping me make an IMPACT.